Kaskaskia is a historically important village in Randolph County, Illinois, United States. In the 2010 census the population was 14, making it the second-smallest incorporated community in the State of Illinois in terms of population, behind Valley City (pop. 13). As a major French colonial town of the Illinois Country, in the 18th century its peak population was about 7,000, when it was a regional center. During the American Revolutionary War, the town, which by then had become an administrative center for the British Province of Quebec, was taken by the Virginia militia during the Illinois campaign. It was designated as the county seat of Illinois County, Virginia, after which it became part of the Northwest Territory in 1787. Kaskaskia was later named as the capital of the United States' Illinois Territory, created on February 3, 1809. 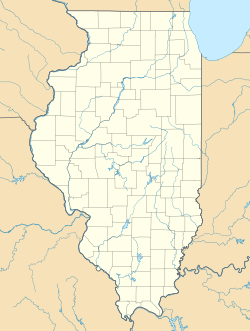 In 1818, when Illinois became the 21st U.S. state, the town briefly served as the state's first capital until 1819, when the capital was moved to more centrally located Vandalia. French colonists named the town after the Illini word for the Kaskaskia River. Historically it was referred to with many spelling variations, as Kasklas, Kaskasky, Cas-caskias, Kasquskias, and Kaskaskias. In 1703, French Jesuit missionaries established a mission with the goal of converting the Illini Native Americans to Catholicism. 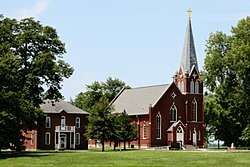 The congregation built its first stone church in 1714. The French also had a fur trading post in the village. Canadien settlers moved in to farm and to exploit the lead mines on the Missouri side of the river. 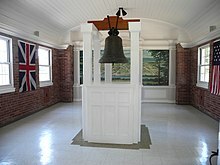 King Louis XV sent a bell to Kaskaskia in 1741 for its church, one of several constructed there. During the years of French rule, Kaskaskia and the other agricultural settlements in the Illinois Country were critical for supplying Lower Louisiana, especially New Orleans, with wheat and corn, as these staple crops could not be grown in the Gulf climate. Farmers shipped tons of flour south over the years, which helped New Orleans survive. From St. Louis to the confluence of the Ohio River, the Mississippi became wider and more shallow, resulting in more severe seasonal flooding. In the late 19th century, the town was cut off from the Illinois mainland and mostly destroyed by repeated flooding and a channel change by the Mississippi River. Much of the former property of Kaskaskia and other French colonial towns on the river has been lost. Following the Great Flood of 1844, residents of Kaskaskia relocated the town to the south. The original location of Kaskaskia became an island, surrounded by the Mississippi River. The flood of 1881 destroyed all remnants of the original town and the Mississippi shifted into the channel of the Kaskaskia River, passing east instead of west of the town. Kaskaskia is located at 37°55′17″N 89°54′59″W﻿ / ﻿37.921395°N 89.916467°W﻿ / 37.921395; -89.916467. According to the 2010 census, Kaskaskia has a total area of 0.11 square miles (0.28 km2), all land. However, the village comprises only a small part of Kaskaskia Precinct, which includes all of Randolph County's land west of the Mississippi. The precinct forms an exclave of Illinois within Missouri. Kaskaskia Precinct has a land area of 24.037 sq mi (62.256 km2) and a 2000 census population of 36 people. In 1993 the Mississippi River almost completely flooded the island. As of the census  of 2000, there were 9 people, 4 households, and 3 families residing in the village. The population density was 83.0/sq mi (32.0/km2). There were 5 housing units at an average density of 46.1/sq mi (17.8/km2). The racial makeup of the village was 7 White, 1 Pacific Islander, 1 from other races. There were 2 Hispanics or Latinos of any race.